was groundbreaking at release and still is a Bible of Integrative Oncology. Founded over 30 years ago the Block Center is one of the world’s leading cancer treatment facilities. 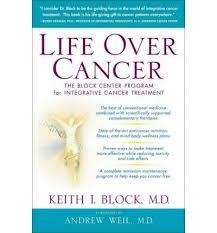 An outpatient clinic specializing in the treatment of the entire range of cancers, the Block Center is dedicated to providing a caring environment that emphasizes the unique biological, physical and psychological qualities of each person treated. Individualized programs are designed to give the patient the best opportunity to live better and to improve the overall quality of life while undergoing treatment. The Block Center team includes board-certified oncologists, internists, physician assistants, oncology nurses, psychologists, social workers, registered dieticians, physical therapists, massage therapists, complementary care specialists, medical researchers and patient care coordinators. Please join us as we are truly honored to be joined by Dr. Keith Block, himself. Dr. Block is the Scientific Director of the Institute for Integrative Cancer Research and Education, where he has collaborated with colleagues at the University of Illinois at Chicago, the University of Texas M.D. Anderson Cancer Center in Houston and Bar Ilan University in Israel. Dr. Block has more than 90 publications in scientific journals relevant to nutritional and integrative oncology.